Epilepsy is a disorder of central nervous system which results in an abnormal brain activity- an unexpected discharge of its neurons, leading to seizure. The word “epilepsy” is derived from the Greek “epilepsia” that literally means to seize or to be taken hold of .Seizure is known as a period of a runaway electrical activity during which the balance between excitatory neurons activity and inhibitory neurons activity is lost .Seizure is followed by alternation in behavior, sensation as well as consciousness .Causes of epilepsy vary by age of the person. Teens and children epilepsy are claimed to occur due to genetic, perinatal and congenital disorders ; meanwhile, drugs, trauma and alcohol are known to be the main cause of epilepsy for adults while cerebrovascular diseases or neoplasms for people over 60 years . Figure 1. Normal EEG compared to EEG including a partial and generalized seizure.Image adapted from . It is estimated that around 50 million people worldwide have been diagnosed with epilepsy, making it one of the most common neurological diseases in the world  which is more frequent in elderly compared to children and adults. The incidence ( number of new cases that develop in a given period of time) in high-income countries ranges from 24 to 71.0 per 100.000 per year, while in low/middle-income countries, the incidence is higher and can be up to 190 per 100,000 . The number of deaths per year in USA from epilepsy as any listed cause has shown a significant increase from 1970 in 2005 to 2962 in 2014 . In 2014, mortality among non-Hispanic Black population (0.70 deaths per 100.00) with a higher mortality rate of males than females . Recent studies reveal that each year about 150.000 Americans (1 in 26 U.S people) are diagnosed with epilepsy . Diagnosing epilepsy requires a good cooperation between the doctor and the patient in order to define the symptoms and the cause as well as a good EEG or MRI understanding. Symptoms such as; uncontrollable jerking and shaking, temporary confusion, collapsing, alternations in sensation of smell, taste, hearing or touch are present according to the type of seizure . A Partial or focal seizure that is caused as a result of abnormal activity in a limited area of the cortex of one cerebral hemisphere. This group has a sub-division according to where there is or not loss of consciousness .Simple partial seizure- seizure without loss of consciousness that originate within the motor cortex. It typically begins on one side of the mouth or in one hand, which sometimes may be followed by involvement of the entire side. 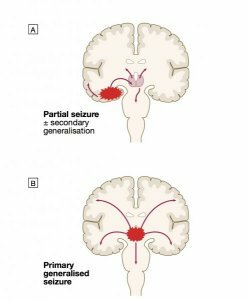 Complex partial seizures- seizure that usually originates from temporal love or the frontal love, preceded by nausea or rising epigastric sensations as well as hallucinations, followed by loss of awareness of surroundings . 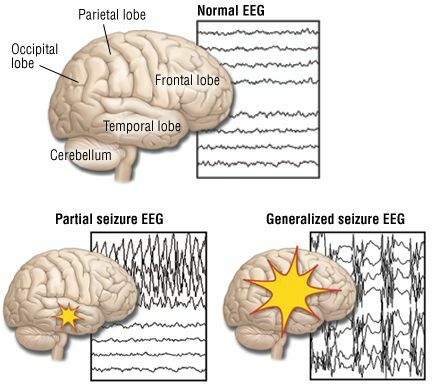 Primary generalized seizures (a group known for involvement of both hemispheres always associated with loss of consciousness) is divided in six types: absence seizures (petit mal), tonic seizures, atonic seizures, myoclonic seizures, tonic-clonic seizures(grand mal) .The partial seizures with secondary generalization tend to occur when partial seizures with electrical activity from one part of the brain involve both hemispheres since inhibitory mechanism fails . Figure 2. The pathophysiological classification of seizures.Image adopted from . The current standard treatment for epilepsy is based on antiepileptic drugs, depending on the type of seizures, as well as surgery. Sodium valproate, Lamotrigine, Carbamazepine, Topiramte are grouped in the first line treatment of grand mal seizures as well as focal seizures with or without secondary generalization and Myoclonic seizures, whereas Phenobarbital, Clonazepam are listed in the second line treatment [grand mal]. In addition to this, Clobazam, Gamapentin, Zonisamide are second line drugs for treatment of focal seizures with or without secondary generalization. But, one of the most frightening fact in neurology is that in many people drugs don’t work. Even though, a great work has been done to reduce side effects and increase the efficacy of drugs, the seizures of around one-third of people with epilepsy are resistant to available medicines . Thus, making surgery the main solution especially for people with focal seizure, by simply removing that region where seizures arise from despite the fact that surgery is considered as a drastic procedure with a suspicious efficacy. Recent studies have shown that injection of NPY-Y2 (neuropeptide Y) combination as well as Kv 1.1 (a voltage-gated potassium channel that electrically quiets neurons) may have a potential impact on anti-focal epileptic drugs resistant people, help them spare the need for surgery. NPY is a neurotransmitter that is increased in brains of people with epilepsy, is consisted of 36 amino acids and its function is to reduce glutamate by acting on five receptors, (Y1-Y5) some of which are excitatory and some inhibitory. During epilepsy, levels of receptors tend to change especially levels of Y2 (a strong neurotransmitter release inhibitor) are increased. Thus, the accumulation of NPY and its receptor levels alternations tend to represent an adaptive response against epilepsy . There have been experiments upon NPY, Y2 and Kv1.1 implemented in rabbits’ brain who were suffering from focal epilepsy. The main point was to determine whether overexpressing of NPY-Y2 reduces seizure frequency. The experiment was implemented by using a recombinant adeno-associated viral vector to deliver NPY gene as well as inhibitory Y2 receptor into the region of the brain where the seizure comes from. The results showed that overexpressing NPY with the inhibitory Y2 (CG01 therapy) has a great anti-seizure effect, which was also successfully introduced into brain tissue surgically removed from people with epilepsy, Merab Kokaia (neuroscientist, Lund University Sweden) confirms . In addition to this, there have been also investigations at University College London (UCL) upon the voltage-gated channel kv1.1- a type of voltage-gated potassium channel that electrically quiets neurons, which confirm that injection of Kv1.1 through a lentivirus vector to excitatory neurons results in tremendous seizure suppression too . Using NPY, Y2 and Kv1.1 all derived from human genes, as a solution for anti-epileptic drugs people excludes the need for brain surgery, Thus, gene therapy is a safer way for a better life for anti-epileptic drug resistant people. COPYRIGHT: This article is the property of We Speak Science, a non-profit institution co-founded by Dr. Detina Zalli and Dr. Argita Zalli (Imperial College London). The article is written by Rexhep Sahatçiu, University of Prishtina, Kosovo. Kumar and Clark’s Clinical Medicine 8th Edition; Neurological disease P.Jarman.